Yesterday I walked you through the process I use for bagging my daily comic strips. The method I outlined there applies to most situations, but there are some cases that call for a slightly modified procedure. The first problem situation is shown in figure 11. If I bagged this daily run in the smallest bag I could, I would end up with a small air pocket along the edge. This is a bad situation because we want to get as much air out as possible, and this little void along the edge defeats that purpose. So I dump that bag and go with the next bigger size (see figure 12). This bag has a lot of extra room, but we'll take care of that. 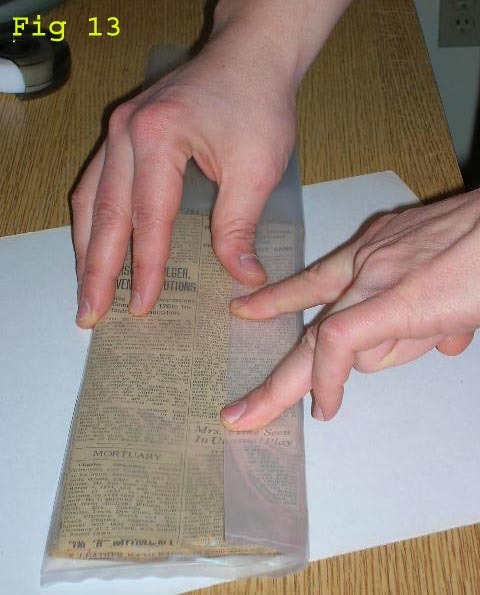 I fold over the excess, making sure to make the fold tight against the edge of the strips (figure 13) and then securely tape this fold. 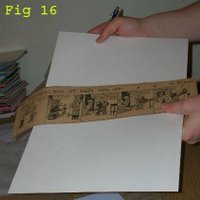 I snug the fold up as tight as I can without warping the strips, then tape first in the middle, then tape the two ends (figure 14). I then cut off the excess at the open end and tape the bag shut as usual. While this procedure could probably be done with the smaller bag, I find that trying to fold over and tape such a tiny excess is a lot harder to do and rarely comes out looking decent. The second situation comes about when bagging either very fragile material or a very small count of strips. If we bag these as normal we end up with a very limp floppy package, and we can easily damage the strips in handling. 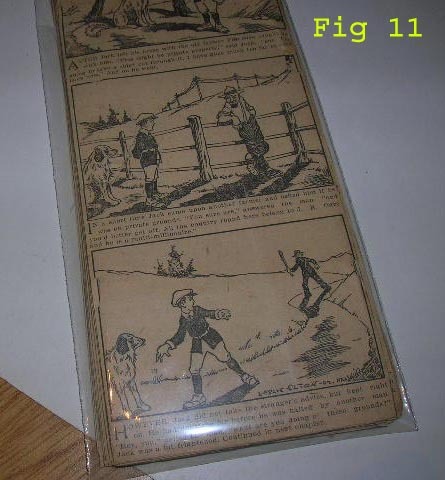 A typical example of a short run of large dailies is shown in figure 15. 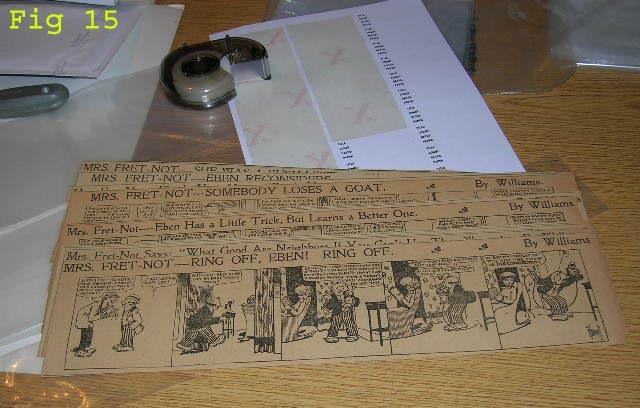 This short run of strips from the mid-1910s are brown and a bit brittle, so I want them to protect them better than just a bag can. 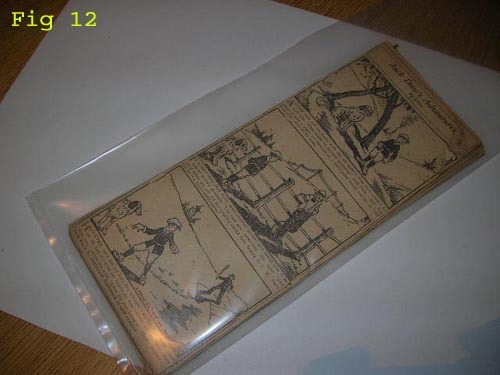 Here we take a cue from the comic book collectors and use backer boards. With all the different sizes of strips we might deal with, we may need a lot of different sizes of backer boards. I solve the problem by buying the largest size I might need (18" x 12", which, by the way, works for tabloid Sundays as well), as shown in figure 16, and then cut the boards down as needed (usually I get two or more backers out of each sheet, even with very large dailies). Since I typically use backer boards with more valuable dailies, I make sure that the boards I buy are made with acid-free coated stock. 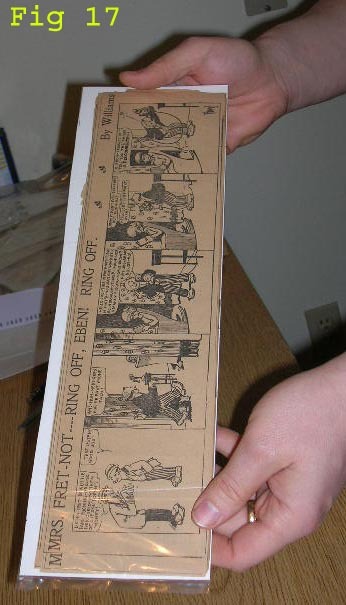 These cost more than your basic dime-store poster board, but I think it's worth it for the peace of mind that you don't have something acidic touching your strips, slowly but surely burning them into brittle oblivion. I buy my backer boards from Bags Unlimited (http://www.bagsunlimited.com), but similar products are available through artist and framing supply shops. I pay about 75 cents per sheet. Because I want the backer boards to fit snugly in my bags, I cut them just shy of the size of the bags, not to the size of the strips. I find I rarely need them on small strips, so I only keep a supply of 5", 6" and 7" wide backers that fit into my larger bags. Cutting the boards down to size on a table saw about ten or so at a time works pretty good, and there's minimal fraying to the edges. If you don't have access to a saw, your local printing company has a wonderful cutting machine about the size of an Escalade, and they'll be happy to cut a batch for you for a small price. 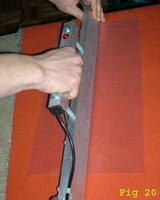 You may also have to occasionally cut custom sizes, but a ruler and a box-cutter make short work of these sheets. 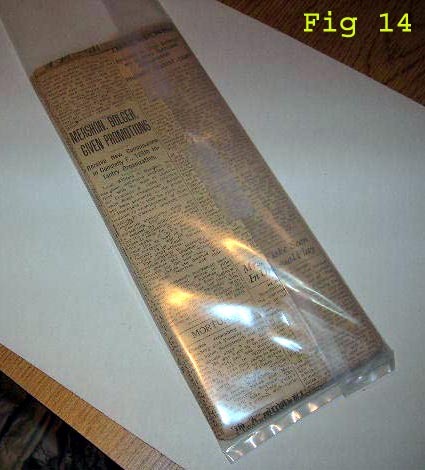 Figure 17 shows the completed job with the backing board in the bag protecting the dailies. This takes care of all the basics of bagging dailies. However, if you're a real stickler for a professional looking job, and the idea of folding bags just won't cut it with you, there's one more option you can consider - customizing bags to your needs. This is not really quite as big a deal as it might sound at first blush, but there is a pretty hefty initial outlay for equipment. 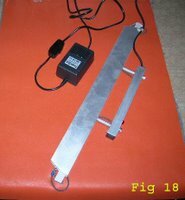 Figure 18 shows a device called a heat sealer. These cost, depending on the size you buy, anywhere from about $50-$150. The size I have (18") is at the high end of that range, and you'll need one that long if you plan to work with large dailies. Heat sealers are available from Bradley's, Uline and other companies that specialize in bags and packaging materials. The one I use I particularly like because it's portable (most heat sealers are meant to sit on a bench, and you bring the work to them), I bought it from Art Marko at National Shrinkwrap. They sell a great product, and their instructional videos do a good job of bringing you right up to speed on the use of the equipment. The heat sealer is a pretty simple device. Inside the main body of the sealer is a wire, and when you activate the sealer it gets red hot. When you press the sealer down on a piece of plastic it makes a clean cut in it. If you press it down on two pieces laying on top of one another, it not only cuts it but seals the two pieces together. This is the magic that allows you to create bags of virtually any custom size you need. I don't recommend that you make customized bags from scratch. It is much simpler to take the bags you have and resize them to fit your needs. That way you only have to make one new seal, not three. Let's walk through the process. First I take a bag, preferably a good deal larger than what I need, lay it on the set of dailies and mark the size I need (figure 19). Don't forget that the bag must be a bit larger than the dailies since there is a thickness component to consider. I mark my line with a Uni-Ball micro pen - these thin marker pens mark well on plastic while most regular ballpoints do not. 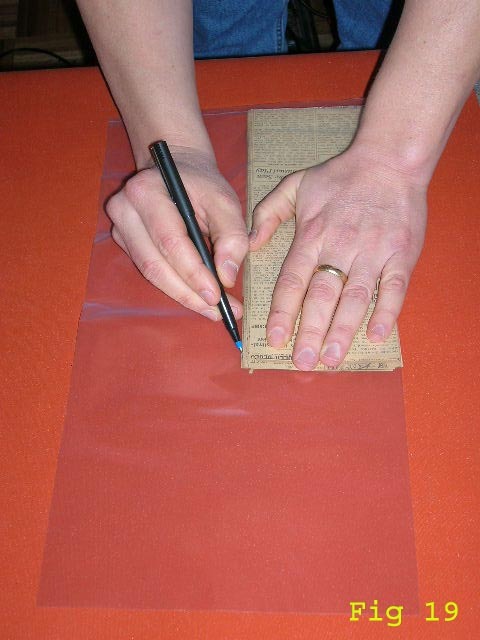 Then I carefully line up the sealer on my line and press it down to cut and seal a new edge on the bag (figure 20). 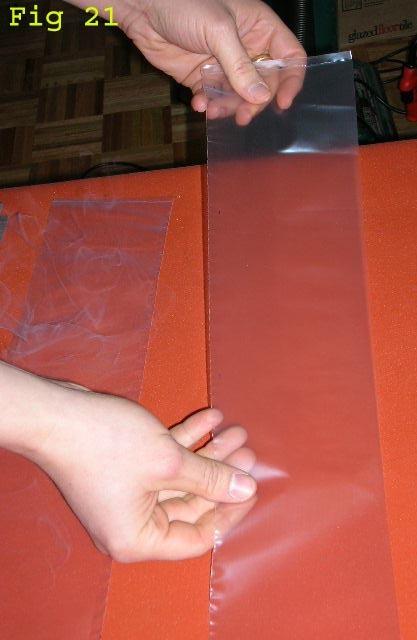 Never do this with the strips inside the bag - you'll burn the edges. The newly resized bag is shown in figure 21, and you can also see in the background that you get a second small bag out of the process (bonus!). Also you can see the smoke wafting through the picture - this is normal. The heat sealer is burning the plastic off of its wire element. If you measured and cut well, your strips will fit like a glove in the newly made custom bag (figure 22). Once you've got the strips in, you'll probably feel the urge to use the sealing tool again to seal the fourth side. Don't do it! You can't get a tight fit without burning the edges of your strips, and you don't want to be melting plastic right up against them. Seal the bags as normal with tape. 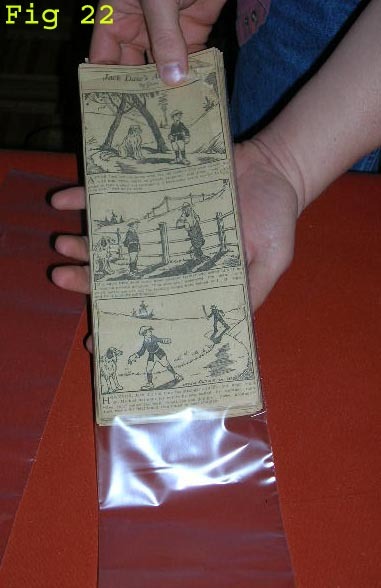 Besides, if you seal it, you'll need to build a new bag any time you get a hankering to reread the strips!